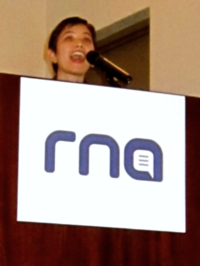 Tikkun Managing Editor Alana Price accepts the RNA 2014 “Magazine of the Year: Overall Excellence in Religion Coverage” award. Credit: Dawn Cherie Araujo. Congratulations to Tikkun, winner of the prestigious 2014 “Magazine of the Year: Overall Excellence in Religion Coverage” award from the Religion Newswriters Association! The Religion Newswriters Association’s awards recognize journalism excellence by measuring a magazine’s grasp on a diversity of religion issues.